Comparison tables help to compare between two or more products. This way, a user chooses a better product. WordPress let’s you create compare functionality by using plugins. In this tutorial, we will look at 5 top WordPress comparison plugins to create such website. Why Use WordPress Comparison Plugins? If you are running a blog or you want to create a new website about comparing products, then WordPress is right choice. WordPress let’s you create this kind of website in few clicks. Also, the reason you might wondering Why should I start writing comparison of products? Well the answer is straightforward that in today’s world everyone wants to buy or pick a right product. When you create a comparison table of products, the users find it easy to select the right one. Unfortunately, the WordPress doesn’t come with such built-in functionality but let’s you extend the WordPress by using plugins. So, in this article, I will be listing the top and best WordPress comparison plugins you can use to create a comparison website. Let’s start our WordPress comparison plugins list with free and then I will include premium ones also. TablePress isn’t specific to the comparison tables, but can be configured to create such tables. This plugin let’s you create all types of tables. Best part of this plugin is that you can add any table anywhere on the post or page by using a short-code. You don’t have to play with code but you will get an interface like spreadsheet where you can easily create, edit, or delete your tables. In addition, it has lots of features which will help you a lot while creating or editing tables. Other features include. Provides lots of premium add-ons to enhance the functionality of plugin. You can easily import or export your tables in Excel or as .csv format. If you want to buy a premium WordPress comparison plugin, this might be a right choice. Plugin pricing starts from $15 to $25. So the pricing is affordable. This plugin let’s users to do drag and drop comparison which no other plugin will provide. You can easily create horizontal and vertical comparison tables of products. You can create as many tables as you want, this plugin doesn’t restrict you. Some other nice features are sorting tables, duplicating, changing width of each individual column, etc. This plugin is recommended because if you face any problem you can ask it’s developers and they will surely help you. This plugin isn’t much popular than TablePress but is gaining popularity. This plugin provides many features like creating comparison tables, specification tables, etc. The best part of this plugin is that it has a responsive design. You don’t have to worry about the mobile responsive design. Just like TablePress, this plugin lets you use short-codes to embed tables anywhere. You can easily upload/insert images inside tables without any hesitation. Do you want something shiny. Go Pricing has more than 250 templates you can use to create beautiful comparison tables. The comparison tables are basically pricing tables but doing some tweaks can make them a better looking comparison tables. Go Pricing plugin comes with Font Awesome integration and has responsive design. Just like other plugins, this one also supports short-codes to place them anywhere. 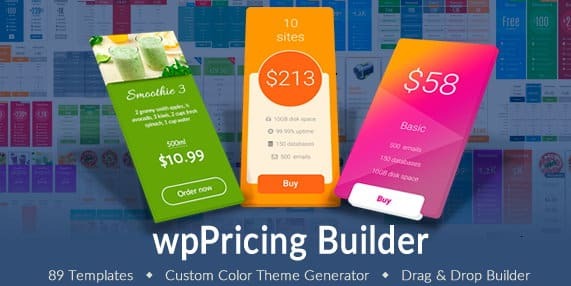 Another great plugin which lets you create pricing tables is WPPricing Builder. This is a premium plugin and comes with over more than 25 templates. WPPricing Builder also has font awesome integration. The best part of this plugin is that it provides a color scheme option while creating tables. This way you can set any color even if you aren’t designer. Its another top notch feature is that you can easily set product attributes, styles and much more. The above mentioned plugins were the 5 top WordPress comparison plugins. My recommendation will be using Go Pricing because you don’t need to be a designer or code geek to create tables. Also, the plugin provides many table templates, so making the work easy. Always choose the plugin which defines your situation, so my recommendation was general. Let me know, which plugin you have used so far and which is working better. I hope you liked this short tutorial, please do share this post.